The primary mode of action of all subdermal implants is to prevent ovulation. Secondary modes of action include the prevention of sperm penetration of the cervical mucus and prevention of implantation by thinning the endometrium. The side effects of subdermal contraceptive implants are similar to other progestogen-only contraceptives of which menstrual disruption is the most common and is the most common reason for discontinuation of the method, and presents a major obstacle to its widespread use. Ovulation returns within 3 weeks of implant removal in 90% of women; therefore, women can be advised that there is no delay in return of fertility after implant removal. The second-generation subdermal contraceptive implants were introduced to Nigeria contraceptive market in 2006, and since then, several studies from the country have explored the acceptability and continuation rates of the method.,,, These studies showed a low acceptance rate, but good continuation rate.,, The present study is to determine the use, prevalence, and continuation rate of subdermal contraceptive implants at Ladoke Akintola University of Technology Teaching Hospital, Ogbomoso, a growing teaching hospital in Southwestern Nigeria. A retrospective review of the clients' case notes who had subdermal contraceptive implants (Implanon and Jadelle) as modern contraceptive method during the study period, from 1 January 2014 to 31 December 2016. Data retrieved from the patient case notes were as follows: client's age, number of living children, educational and marital status, duration of use of the method, reasons for discontinuation of the method, and complications experienced with the method. Data were analyzed using SPSS version 17 (SPSS Statistics for Windows, Version 17.0. Chicago: SPSS Inc. 2008). Mean and standard deviation were used to summarize continuous variables while frequency and percentage were used for categorical variables. 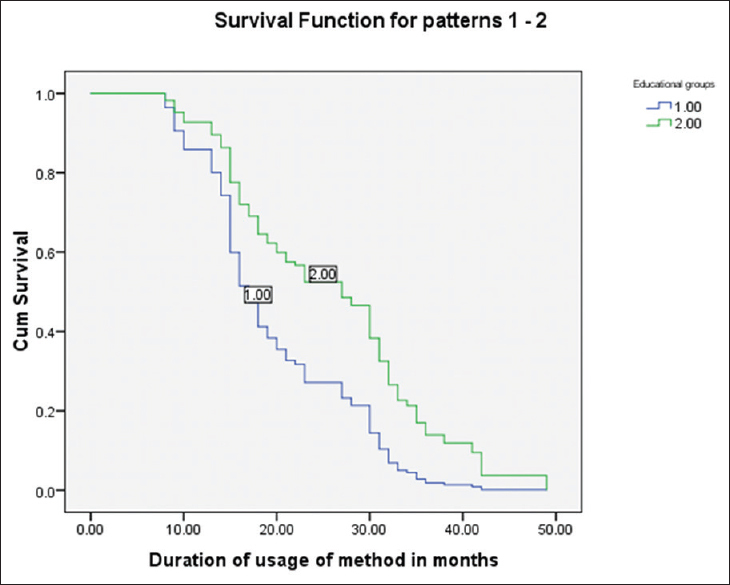 The Kaplan–Meier survival analysis was performed to determine the continuation rate of the implants by the clients, whereas Cox regression analysis was performed to determine factors influencing the continuation rate. Level of significance was set at a value of P < 0.05%. One hundred and forty-two clients made subdermal contraceptive implants their method of choice during the study period, accounting for 15.3% of the 928 modern contraceptive acceptors. Of the 142 acceptors, 115 (81%) chose Implanon, whereas 27 (19%) chose Jadelle. Most of the acceptors were married 133 (93.7%), whereas 9 (6.3%) were single. Seventy-nine of the clients (55.6%) used the method for child spacing, whereas 63 (44.4%) used the method to limit the size of the family. The duration of use of the method was between 6 and 49 months with a mean of 22.1 ± 8.94. The age of the clients ranged between 20 and 48 years with a mean of 32.9 ± 5.70. Other sociodemographic characteristics of the clients are shown in [Table 1]. Their weight ranged between 41.70 and 124.10 kg with a mean of 66.3 ± 14.00. Thirty (21.1%) of the client experienced some side effects of the methods, of which irregular vaginal bleeding 19 (63.4%) was the most common; other side effects experienced were excessive menstrual flow 6 (20%), and weight gain 5 (16.7%). 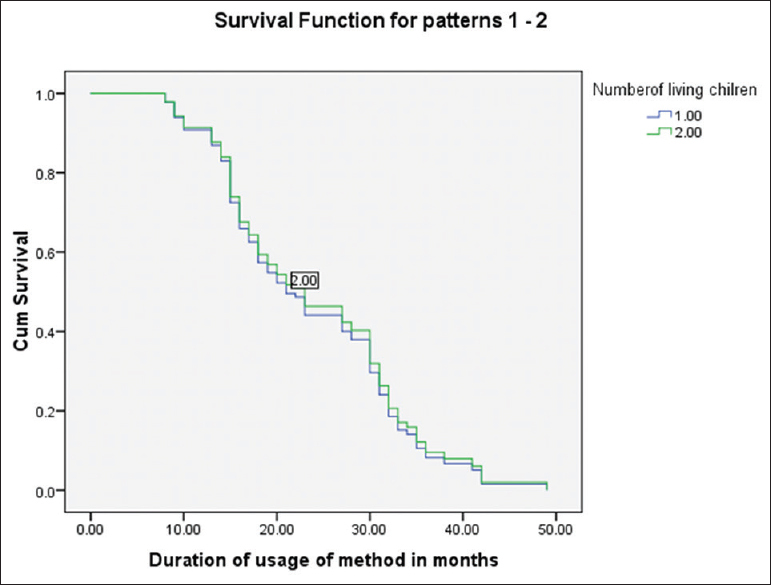 Of the clients that discontinued the method 25 (17.6%), the most common reason was to get pregnant 20 (80%); other reasons for discontinuation were menorrhagia 3 (12%), and irregular vaginal bleeding 2 (8%). There was no report of accidental pregnancy by any of the clients during the study period. 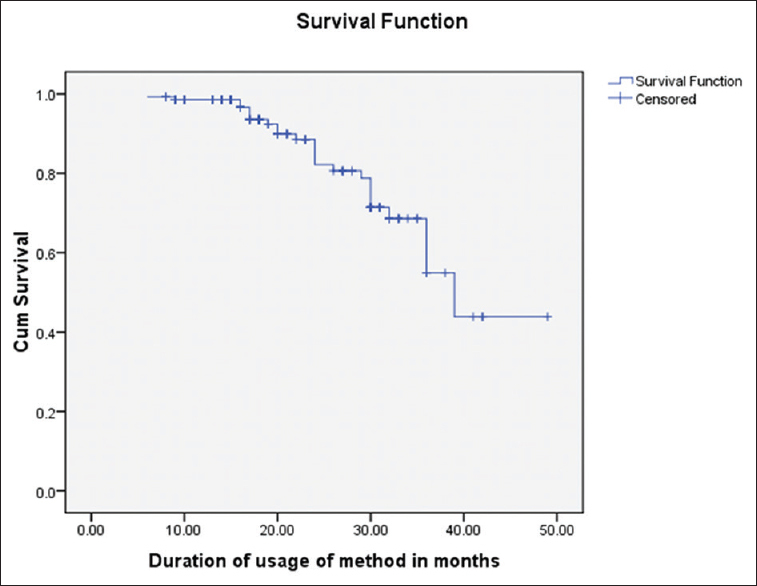 Using the Kaplan–Meier survival analysis, more than 50% of the clients will be on a method for at least 39 months [Figure 1]. Using the Cox regression analysis, combining number of living children with educational status, clients having tertiary education stayed longer on the method compared with those with lower education (odds ratio [OR]: 2.02:95% confidence interval [CI]: 1.345–3.05) [Figure 2]. However, number of living children did not significantly affect the continuation rate of subdermal contraceptive implants (P = 0.789) [Figure 3]. The prevalence of subdermal contraceptive implants in this study is 15.3%. This is higher than the 4.3% from Port Harcourt, 4.3% from Ibadan, 7% from Zaria, and 13.4% from Jos. However, it is a lower rate than the 18.6% from Uyo, and 31.9% from Abakaliki. The higher prevalence rate may be explained by the more awareness of subdermal contraceptive implants, as many of the studies with the low prevalence rates were done in the first few years of the introduction of the second-generation subdermal implants into Nigeria contraceptive market. The side effects of the subdermal contraceptive implants experienced by the clients in this study were irregular vaginal bleeding, menorrhagia, and weight gain. These were the side effects of the method that had been documented from other studies.,,,, These side effects are those that had been documented to be associated with progestogen-only contraceptives generally.,, There was a good continuation rate of the method by the clients as more than 50% were still using the method 39 months after insertion. Only 17.6% of the clients discontinued the method, and the reason for discontinuation was mostly to conceive (80%), and only 20% of those that discontinued, did so because of the side effects. This is at variance with the study of Madugu et al. in which there was a high discontinuation rate of subdermal implants and those that discontinued did so as a result of side effects. Studies from Port Harcourt, Ibadan, and Uyo showed a good continuation rate of subdermal implants as it is in the present study. Ojule et al. and Igwe et al. also found that the most common reason for discontinuation was to get pregnant. Education was found to be a significant factor (OR: 2.02:95% CI: 1.345–3.05) for the high continuation rate of subdermal contraceptive implants by the clients in this study. Formal education had been shown to positively influence the use of contraceptives generally. Subdermal contraceptive implants are well tolerated, long lasting reversible methods with good continuation rate among our clients, and will be a good alternative in our population that has aversion to female surgical sterilization. Jacobstein R, Polis CB. Progestin-only contraception: Injectables and implants. Best Pract Res Clin Obstet Gynaecol 2014;28:795-806. Oloto E, Mascarentas L. Subdermal contraceptive implants. Br J Fam Plann 2000;26:171-4. Darney PD. Hormonal implants: Contraception for a new century. Am J Obstet Gynecol 1994;170:1536-43. Damey PD. Hormonal implants: Contraception for a new century. Am J Obstet Gynecol 1994;170:1536-43. Glasier A. Implantable contraceptives for women: Effectiveness, discontinuation rates, return of fertility, and outcome of pregnancies. Contraception 2002;65:29-37. Madugu NH, Abdul MA, Bawa U, Kalawole B. Uptake of hormonal implant contraceptives in Zaria, Northern Nigeria. Open J Obstet Gynaecol 2015;5:268-73. Mutihir JT, Nyango DD. One-year experience with implanon subdermal Implants in Jos Nigeria. Nig J Clin Pract 2010;13:28-31. Ojule JD, Oranu EO, Enyindah CE. Experience with implanon in Southern Nigeria. J Med Med Sci 2012;3:710-4. Roberts AO, Morhason-Bello IO, Okunlola MA, Adekunle AO. Profile of implanon acceptors and pattern of side effects. J Reprod Contracept 2015;26:46-52. Abasiattai AM, Utuk NM, Inyang-Etoh EC. 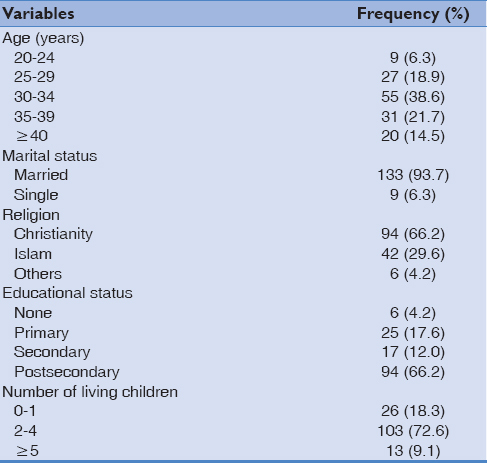 Subdermal contraceptive implants: Profile of acceptors in a tertiary hospital in Southern Nigeria. Int J Gynaecol Obstet Neonatal Care 2014;1:9-13. Igwe NW, Nnamdi EB, Jude AJ. A 5-year clinical evaluation of subdermal implants among abakaliki acceptors. J Basic Clin Reprod Sci 2016;5:1-5. Adeyemi AS, Adekanle DA. Progestogen-only injectable contraceptive: Experience of women in Osogbo, Southwestern Nigeria. Ann Afr Med 2012;11:27-31. Akadri AA, Odelola OI. Progestogen-only injectable contraceptive: Acceptor prevalence and client experience at Sagamu, Nigeria. Niger Postgrad Med J 2017;24:178-81. Adekanle DA, Afolabi AF, Adeyemi AS. Terminal fertility control: Clients own reason for the choice of the contraceptive method. Open J Obstet Gynaecol 2013;3:706-9.